Damon Amand Jones, II, 20, of League City: Charged with felony possession of marijuana. Avery Blake Daniel, 20, of League City: Charged with felony possession of marijuana. Trooper Chad Seamans displays the goods. Local Trooper Makes Marijuana Bust in Routine Traffic Stop, GOODRICH, April 29, 2013 - At approximately 9:30 pm on April 27, 2013, Trooper Chad Seamans with the Texas Highway Patrol was patrolling on US-59 in the area of Goodrich. Seamans pulled over a tan colored 2001 Honda sedan for driving in the wrong lane of traffic. The sedan pulled into the parking lot of Polk's Pick It Up in Goodrich. When trooper Seamans spoke to the driver (Damon Amand Jones, II, 20 of League City) he noticed that the Jones was acting nervous. Trooper Seamans had Jones and his passenger, Avery Blake Daniel, 20, also of League City to step out of the vehicle. When Seamans asked where they were going, Jones stated they were going to check out the gym and SFA university, the other stated they were going to visit a friend. The conflicting stories, combined with the nervous behaviour made Seamans suspicious. Seamans asked for consent to search the vehicle, but Jones refused to give consent. No problem, Seamans summoned a DPS canine to walk around the vehicle. By now, Seamans was backed up by fellow Trooper, Chris Cain and Deputy Mike Nettles with the Polk County Sheriff's Office. Troopers Travis Richnow and Canine Gordon arrived. Canine Trooper Gordon did a walk around and alerted Trooper Richnow of contraband. Probable cause was established and a vehicle search was underway. Seamans found a Nike carrying bag with a large plastic container inside. The container had two bags with large amounts of marijuana. Both men claimed that they didn't know that the marijuana was there. According to Trooper Seamans, the hippy lettuce smells, and appears to be hydroponic marijuana (grown and cultivated indoors with special equipment and is much more potent than marijuana grown outdoors). However, a receipt was found with the dope that showed a recent purchase that matched a credit card that was in Jones' possession. Both were placed under arrest and charged with felony possession of marijuana. 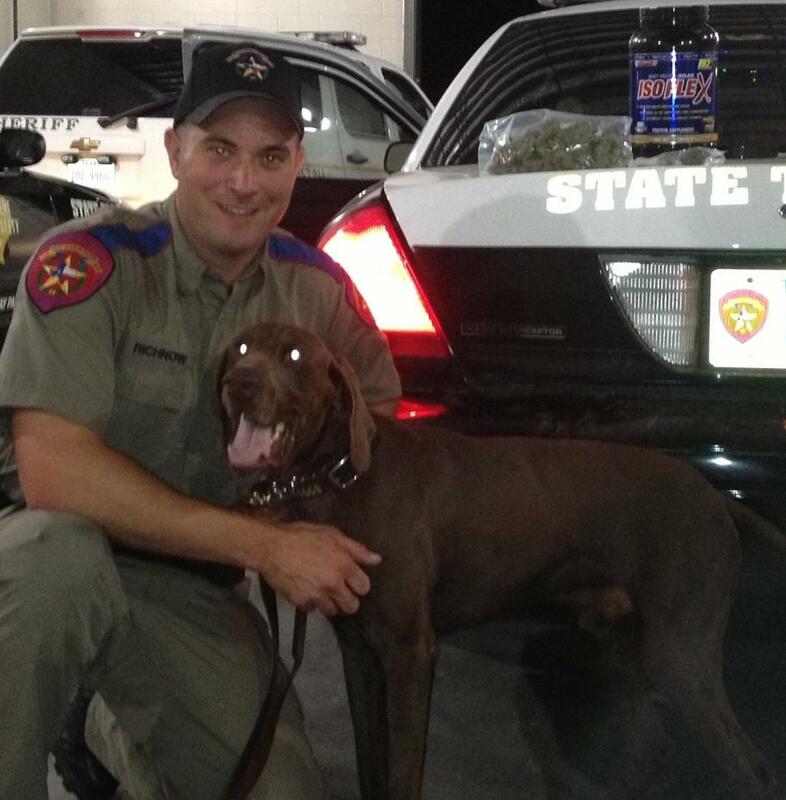 Trooper Travis Richnow (left) and Canine Trooper Gordon. Gordon alerted the other Troopers and Deputy Nettles of the marijuana.